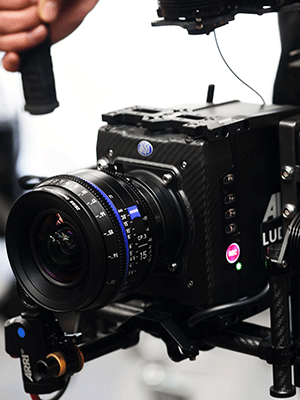 The ZEISS CP.3 Cinema Primes have all the characteristics that have made ZEISS lenses sought after for decades. Sharp, crisp images. Immaculate build quality. Theyre well known for their sheer value too. The new CP.3 prime lenses and their metadata-enabled siblings, the CP.3 XD prime lenses, stand out because they perform like top-end lenses, while their prices mean that theyre accessible to all levels of professional filmmaking. CGI and VFX play an essential role in many - if not most - productions today. Were a long way from the early days of CGI where computers were mainly used to create alien creatures and physically impossible special effects. Today the computer arts have a much more prosaic, but arguably even more important role, which is to replace scenery. Its often cheaper and easier in todays environment to create a backdrop (or even foreground objects) artificially than to shoot them on location. Imagine shooting a scene in front of the White House. Its not going to happen. But with CGI it can. The same goes for virtually any kind of science fiction. And now, even costume dramas rely extensively on artificially generated scenery. It saves time, effort and fundamentally makes certain types of production viable, where they wouldnt have been without the technology. The pinnacle of CGI and VFX is where live action and computer generated worlds appear in the same scene - without the audience noticing. Matching live action to CGI is an art in itself: its easy to imagine the difficulties. But theres one area in particular where theres a very significant room for improvement. Its the process of matching the characteristics and settings of lenses to the computer generated world. Most of the time, this is a manual process. It involves entering lens characteristics into the CGI software, so that the CGI application can compensate for the difference between the light entering the lens and leaving it. All lenses have a characteristic effect on an image. Theres the fixed effect of each lens, which includes Shading and Distortion, and theres the real time settings of the lens too (Iris, Focus, etc). Each and every one of these parameters will need to be taken into account by the CGI software, in order to map the lenss image onto the computer generated components. Until now, entering and maintaining this data has been a laborious manual process. But now, with ZEISS eXtended Data technology implemented in the CP.3 XD lenses, the process is, as far as possible, completely automatic. Real-time metadata for focus, Iris, Shading and Distortion is easily transferred to the applications that need to make use of it. High end facilities will profit from this because they can complete their work faster - and quite possibly better. Smaller production units will be able to work faster and save money - and perhaps undertake projects that they wouldnt have considered viable before. For a DITs (Digital Imaging Technicians) and on-set personnel, eXtended Data means that not only the images but vital information about the images can be sent digitally, safely and quickly to post production. In some cases it might also mean that its easier to visualise the finished look on-set, which is a huge boost to productivity - and confidence - to the creatives at the sharp end of the production. ZEISS eXtended Data will allow us to speed up the post production process and allow multiple camera units to work more effectively together, all twinned with the optical quality you can expect from ZEISS. We found the idea of being able to record detailed lens information frame by frame and adjust distortion very impressive. This will open up an exciting new world of creative possibilities. In the world of motion graphics and live capture, the possibility of seamlessly retaining detailed lens information is massive. In future, there will be even more CGI. There will be more VFX. But thats just the start. As we move beyond the rectangular screen towards Extended Reality (XR, which includes Virtual Reality and 360 degree video) its important to choose lenses carefully. ZEISS CP.3 lenses with eXtended Data are ready for this new world; a place where metadata becomes almost as important in the workflow as the image itself. Theyre a sound investment for now, and a great choice for the years to come.